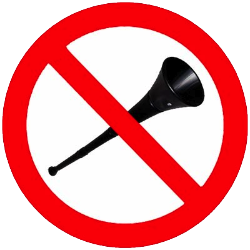 I really, really hate the vuvuzela. The noise that those cursed “instruments” make sounds to me like a cross between a pair of yaks mating, and a pair of yaks dying an excruciatingly painful death. As I wrote previously, those abominations were all over the LA Convention Center during Anime Expo, and it seemed to me that practically every few seconds, the center was filled with that abominable noise. Really distracting, and even worse, a potential medical liability for those especially close to the offensive noisemaker. Finally, a voice of sanity! Good on you, Otakon.